… had a pet bear when he was studying at Cambridge because he wanted to protest against the university’s policy against keeping dogs. In fact, he loved animals and had quite a few during his lifetime, most notably monkeys, peacocks, a parrot, a fox and a crocodile. Despite having a lame foot, he had numerous affairs with both men and women. He even had an intimate relationship with his half-sister, Augusta. Lord Byron traveled all over Europe, and he even fought in the Greek War of Independence. His father left when the poet was young, and his mother was schizophrenic. 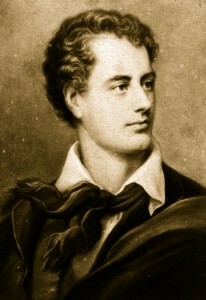 Lord Byron inherited his title when he was 10, after the death of a great-uncle.